Full points if you recognise this place which may look like other arcades, but I'd be surprised if very many of you have been here. It's Royal Opera Arcade, just behind Pall Mall and not somewhere you are likely to end up by accident. 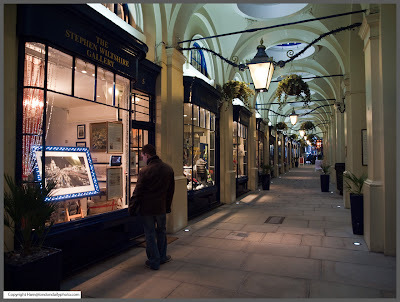 Some interesting shops and galleries there, most notably Stephen Wiltshire. No, the name won't be familiar, but if you saw him in 1987 on the BBC program "The Foolish Wise Ones", you won't have forgotten him. Autistic, at 13, he could draw perfectly detailed architectural drawings from memory. He still can. Comments on "The Arcade Less Travelled"